Published on 17 September 2012. 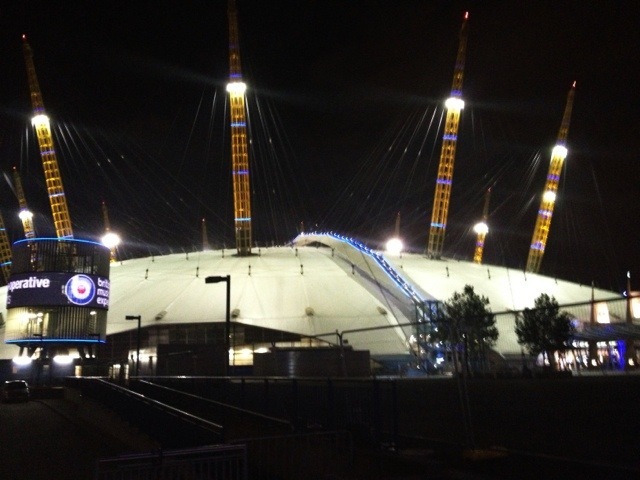 No prizes for guessing where I’ve been tonight… The Millennium Dome, now the O2, Richard Rogers’s homage to the Festival of Britain’s Dome of Discovery. Its time-obsessed dimensions reflect the reason for its construction: 12 pillars, one pillar for each month of the year; 52m high, one metre for each week of the year; a diameter of 365m, one metre for each day of the year. And there’s that remarkable statistic that the 1mm-thick glass-fibre fabric of the roof weighs less than than the air contained within the dome itself, yet could support the weight of a jumbo jet. In the furore over the Dome’s innards, it’s often forgotten that the building itself was constructed in just 15 months, and – at £43m – substantially under-budget. It’s hard to believe that it’s twelve years since my family and I first visited the site, to see the much-maligned (though highly rated by 85% of actual visitors) Millennium Experience. We had a great time, though I recall that we were really rather baffled over what the unifying theme of the attractions was supposed to be. I’ve returned quite a few times since, usually just to grab dinner when in London and nearby… which is exactly why I was there tonight! This 1,813th post was filed under: Photo-a-day 2012, London, O2.